This article is about the mountain range. For the city, see Huangshan City. For other uses, see Huangshan (disambiguation). The Huangshan mountain range has many peaks, some more than 1,000 meters (3,250 feet) high. The three tallest and best-known peaks are Lotus Peak (Lianhua Feng, 1,864 m), Bright Peak (Guangming Ding, 1,860 m), and Celestial Peak (Tiandu Feng, literally Capital of Heaven Peak, 1,829 m). The World Heritage Site covers a core area of 154 square kilometres and a buffer zone of 142 square kilometres. The mountains were formed in the Mesozoic, approximately 100 million years ago, when an ancient sea disappeared due to uplift. Later, in the Quaternary Period, the landscape was shaped by the influence of glaciers. The vegetation of the area varies with elevation. Mesic forests cover the landscape below 1,100 meters. Deciduous forest stretches from 1,100 meters up to the tree line at 1,800 meters. Above that point, the vegetation consists of alpine grasslands. 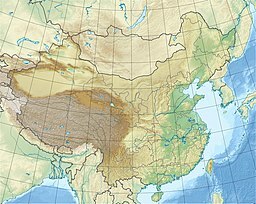 The area has diverse flora, where one-third of China's bryophyte families and more than half of its fern families are represented. The Huangshan pine (Pinus hwangshanensis) is named after Huangshan and is considered an example of vigor because the trees thrive by growing straight out of the rocks. Many of the pine trees in the area are more than a hundred years old and have been given their own names (such as the Ying Ke Pine, or Welcoming-Guests Pine, which is thought to be more than 1500 years old). The pines vary greatly in shape and size, with the most crooked of the trees being considered the most attractive. Furthermore, Huangshan's moist climate facilitates the growing of tea leaves, and the mountain has been called "one of China's premier green tea-growing mountains. Mao feng cha ("Fur Peak Tea"), a well-known local variety of green tea, takes its name from the downy tips of tea leaves found in the Huangshan area. To enjoy the magnificence of a mountain, you have to look upwards in most cases. To enjoy Mount Huangshan, however, you've got to look downward. The area also is host to notable light effects, such as the renowned sunrises. Watching the sunrise is considered a "mandatory" part of visiting the area. A phenomenon known as Buddha's Light (Chinese: 佛光; pinyin: fóguāng) is also well-known and, on average, Buddha's Light only appears a couple of times per month. In addition, Huangshan has multiple hot springs, most of them located at the foot of the Purple Cloud Peak. The water stays at 42 °C(107.6°F) all year, and has a high concentration of carbonates. The waters are said to help prevent skin, joint, and nerve illness. During the Qin Dynasty, Huangshan was known as Yishan (Mount Yi). In 747 AD, its name was changed to Huangshan (Mount Huang) by imperial decree; the name is commonly thought to have been coined in honor of Huang Di (the Yellow Emperor), a legendary Chinese emperor, and the mythological ancestor of the Han Chinese. One legend states that Huangshan was the location from which the Yellow Emperor ascended to Heaven. Another legend states that the Yellow Emperor "cultivated moral character and refined Pills of Immortality in the mountains, and in so doing gave the mountains his name. The first use of this name "Huangshan" often is attributed to Chinese poet Li Bai. Huangshan was fairly inaccessible and little-known in ancient times, but its change of name in 747 AD seems to have brought the area more attention; from then on, the area was visited frequently and many temples were built there. Over the years, many scenic spots and physical features on the mountain have been named; many of the names have narratives behind them. For example, one legend tells of a man who did not believe the tales of Huangshan's beauty and went to the mountains to see them; almost immediately, he was converted to the same view. One of the peaks he is said to have visited was named Shixin (始信), roughly meaning "start to believe." In 1982, Huangshan was declared a "site of scenic beauty and historic interest" by the State Council of the People's Republic of China. It was named a UNESCO World Heritage Site in 1990 for its scenery and for its role as a habitat for rare and threatened species. Much of Huangshan's reputation derives from its significance in Chinese arts and literature. In addition to inspiring poets such as Li Bai, Huangshan and the scenery therein has been the frequent subject of poetry and artwork, especially Chinese ink painting and, more recently, photography. Overall, from the Tang Dynasty to the end of the Qing Dynasty, more than 20,000 poems were written about Huangshan, and a school of painting named after it. The mountains also have appeared in modern works; James Cameron, director of the 2009 film Avatar, cited Huangshan as one of his influences in designing the fictional world of that film, and Chinese animated series Stitch & Ai, a spin-off of Disney's Lilo & Stitch franchise, is set in the Huangshan mountains. The area also has been a location for scientific research because of its diversity of flora and wildlife. In the early part of the twentieth century, the geology and vegetation of Huangshan were the subjects of multiple studies by both Chinese and foreign scientists. The mountain is still a subject of research. For example, in the late twentieth century a team of researchers used the area for a field study of Tibetan macaques, a local species of monkey. Having at least 140 sections open to visitors, Huangshan is a major tourist destination in China. Huangshan City changed its name from Tunxi in 1987 in order to promote Huangshan tourism. In 2007, for instance, more than 1.5 million tourists visited the mountain. The foot of the mountain is linked by rail and by air to Shanghai, and also is accessible from cities such as Hangzhou and Wuhu. As of 1990, there were more than 50 kilometers of footpaths providing access to scenic areas for visitors and staffers of the facilities. Today there are also cable cars that tourists may use to ride directly from the base to one of the summits. Throughout the area there are hotels and guest houses that accommodate overnight visitors, many of whom hike up the mountains, spend the night at one of the peaks to view the sunrise, and then descend by a different route the next day. The area is classified as a AAAAA scenic area by the China National Tourism Administration. Huangshan has a humid continental climate (Köppen Climate Classification Dfb). Its elevation makes it colder and wetter than the rest of Anhui. ^ a b c "Lianhua Feng - Lotus Peak, HP Huang Shan" on Peaklist.org - Central and Eastern China, Taiwan and Korea. This data is specific to the high point of the range only. Retrieved 2011-10-5. ^ a b c d e f g Bernstein, pp. 125–127. ^ "Huangshan Mountain". [Huangshan Tour]. Archived from the original on 3 March 2009. Retrieved 2008-08-05. ^ a b c d e f Cao, pp. 114–127. ^ a b "Mount Huangshan - UNESCO World Heritage Center". UNESCO. 2008. Retrieved 2008-08-05. ^ a b c d e f Huangshan Mountains, p. 12. ^ a b c d e f g Guo, pp. 62–64. ^ "Yellow Mountain Maofeng Tea". [Cultural China]. Archived from the original on 2009-03-02. Retrieved 2008-10-08. ^ a b c d e Butterfield, Fox (1981-02-08). "China's Majestic Huang Shan". New York Times. Retrieved 2008-10-08. ^ China News Service (21 December 2007). ""Buddha's Light" in Huangshan Mountain". China.org.cn. Retrieved 23 December 2008. ^ Raitisoja, Geni (4 October 2006). "Huangshan: "No. 1 Mountain Under Heaven"". gbtimes.com. Retrieved 30 December 2014. ^ a b c d e f g "Mount Huangshan Scenic Beauty and Historic Interest Site". [Protected Areas and World Heritage]. United Nations Environment Programme. October 1990. Archived from the original on 2008-05-10. Retrieved 2008-10-08. ^ a b "Huang Shan". [ChinaTravel.net]. Retrieved 2008-10-08. ^ McGraw, David (2003). "Magic Precincts" (PDF). University of Hawaii. Archived from the original (PDF) on 18 September 2009. Retrieved 6 December 2008. p. 52. ^ a b "Mount Huangshan". China.org.cn. 1990. Retrieved 2008-10-08. ^ Renjie, Mao (24 December 2009). "Stunning Avatar". Global Times. Archived from the original on 28 December 2009. Retrieved 24 January 2010. ^ "China's Huangshan to restrict vehicles during Olympics". Xinhua. 3 August 2008. Archived from the original on 6 November 2012. Retrieved 6 September 2010. ^ "Hefei, Anhui Province". Archived from the original on 20 December 2008. Retrieved 23 December 2008. ^ 黄山风景区-天气预报. China Meteorological Administration. Retrieved 2018-08-08. Bernstein, Ken (1999). China pocket guide. Revised by JD Brown; edited by Richard Wallis. Berlitz Publishing Company. ISBN 2-8315-7049-2. Cao Nanyan (2003). China: World Heritage Sites. Beijing: China Architecture and Building Press. ISBN 0-7607-8685-2. Guo Changjian; Song Jianzhi (2003). World Heritage Sites in China. 五洲传播出版社 (Wuzhou Publishing House). ISBN 7-5085-0226-4. Heiss, Mary Lou; Robert J. Heiss (2007). The Story of Tea. Ten Speed Press. ISBN 1-58008-745-0. Huangshan Mountains. China Travel and Tourism Press. 1998. ISBN 7-5032-1520-8. Ogawa, Hideshi; Akie Yanagi (2006). Wily Monkeys: Social Intelligence of Tibetan Macaques. Trans Pacific Press. ISBN 1-920901-97-3.